Don’t let this be you as the next tax deadline rolls around. Due to the 2018 Tax Cuts and Jobs Act, many if not all, taxpayers will be affected in some way. Some good and some not so good, which is why 2018 is such a critical year for tax planning. 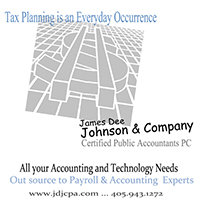 If you have not done any tax planning in prior years, you must consider doing so for 2018. 2018 tax year is rounding down. We are now in the 4th quarter. Please contact our office. Our professional staff will readily be available to discuss these tax changes with you. Welcome to our website! If you are looking for a blend of personal service and expertise, you have come to the right place. We offer a wide range of services for individuals, business owners, executives and independent professionals. Combined we have over 100 years experience that we can put to work for you! Please call us for a free initial consultation. © 2019 James Dee Johnson & Company All Rights Reserved.